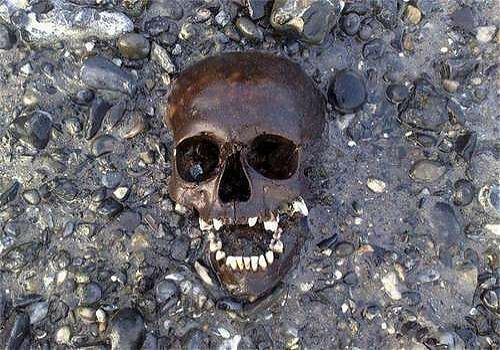 In June 2009, one of our FROG members, Jeremy Fielden, mentioned that he had seen some amazing photos of a human skull found on the foreshore near Burrell’s Wharf on the Thames and Field website. Over the past six months the TDP, together with the Mudlarker who discovered the skull, Nick Stevens from the Thames and Field Metal Detecting Society, have continued to investigate this and we have some very exciting news to report! Nick first discovered the skull while walking along the foreshore in April 2009. He informed the police who came down to the site straight away and removed it for further examination. They decided that it was not a forensic case and so the skull was passed to the care of the Osteoarchaeology section at the Museum of London, where it was assessed by Don Walker and Natasha Powers. However, the date of the skull was not determined until the TDP, with the generous support of English Heritage (thank you to John Meadows and Jane Sidell), sent a sample for dating. The sample returned a date of cal AD 1735–1805 (52.8% probability), placing the remains firmly in the post-medieval period – a very intriguing date indeed. Examination of maps dating to this period, such as the Rocque map of the mid 18th century, show that the Isle of Dogs was largely undeveloped at this time; the main features of interest are the line of mills stretching along the western side of the Isle (hence ‘Millwall’), ‘Horseferry House’ at the southern tip of the peninsula and a gallows in between….. The police did return to the site and could not find any further bones (although they did retrieve some animal bones). However, the fact that the skull had survived with its jawbone intact suggested a possible articulated burial so in December 2009, Nick and I returned to the foreshore to try and re-examine the spot. Unfortunately the marker Nick had placed was gone. Not to be deterred we went back again on January 4th 2010 and found parts of the upper torso and arm. Then the tide came in…We came back the following day with a full team: Gus Milne, Lorna and myself (Nathalie),from the TDP team, Nick Stevens from the Thames & Field Metal Detecting Society, Don Walker (MoL Osteoarchaeology), Mark Burch and Sarah Jones (MoLA Geomatics) and Brigid Geist (FROG member). We also brought Anies Hassan of Tollan Films to record the remains in situ. What we have recovered is very exciting – a largely complete skeleton of a fairly young individual (probably around 12 years old) – buried on the foreshore. Although it was difficult to see a distinct grave cut, we can be certain that the body had been placed in a hole, given the changes noticeable in the immediate context of the burial and the articulation of the skeleton (basically where and how the body was laid out). We were even able to recover most of the very small bones of the hands and feet. Excavation was challenging to say the least – as the burial lay very close to the low tide level we only had around an hour to uncover, lift and record the bones, and this process was made more difficult by the fact that every time a vessel went by the resultant waves threatened to wash away any exposed material. Consequently once the bones were exposed, they were photographed and immediately lifted so that they weren’t lost. I look forward to updating you all with more information about this exciting find – all of the remains are currently with the Osteoarchaeology section for further analysis. This project is also a fantastic example of the different groups involved with searching the foreshore working together and it will be great if there are more projects like this in the future.